Hotels in Davos Switzerland online hotel booking | Low price guarantee no reservation fees! Davos is a village in the Graubünden in the east of Switzerland. Davos is being visited by many touristst in winter and summer. Davos is the largest resort in the Alps for mountain holidays. In winter snow sports activities and the beautiful views of the Alps are the main reason tourists come here. The best ski & snowboard spots are the Parsenn and Weissfluhjoch an area neighbouring the resort of Klosters and the Jakobshorn a perfect spot for snowboarders with its half-pipe and monster pipe. TIP: take a ride in a horse-drawn sledge into the snowy side valleys, or a hike on the beautifully prepared winter footpaths and snow-shoe trails. In the Summer the sports activities are: hang-gliding, paragliding, mountain biking, tour biking, climbing, hiking and inline skating, there are many routes and trails in the stunning Alps. Parsenn including the Weissfluhjoch und -gipfel (2844 m), Pischa (2483 m), Rinerhorn (2490 m) and Schatzalp/Strela provide access to four hiking areas with a total of 450 km of marked footpaths. Or visit the Davos Lake with its swimming area and a sailing and surfing centre. In Davos there are more than 40 different hotels and other sleeping possibilities. You will find anything from two star to five star hotels or a camping place. A small selection of the hotels in Davos is: Steigenberger Grandhotel Belvedere five stars, InterContinental Davos five stars, Rixos Flüela Davos five stars, Grischa - Das Hotel Davos four stars, Hilton Garden Inn Davos four stars, Sheraton Davos Hotel Waldhuus four stars, Hotel Seehof four stars, Hotel Europe four stars, Cresta Sun four stars, Sunstar Alpine Hotel & SPA Davos four stars and Apartment Village Solaria three stars. 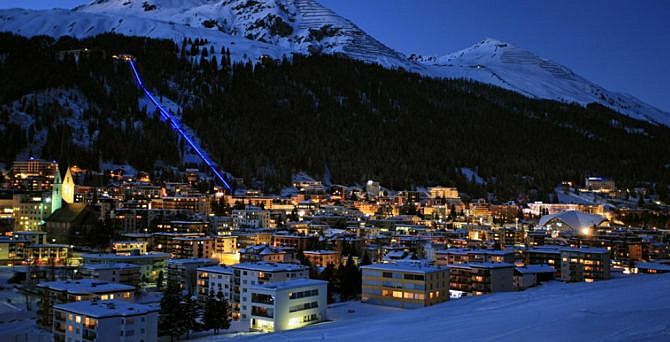 From cheap hotels to luxury hotels in Davos Switzerland, use HotelsinDavos.COM for online booking of your vacation, long stay, holidays, weekend away, overnight stay, business travels, weekend getaways, hotel specials, last minute or hotel reservations.